Crazy Taxi is a conversion of a racing hit prepared by Strangelite studio, originally released on the Sega Dreamcast console. The player plays the role of a taxi driver, and his task is to transport as many clients as possible within the set time limit. 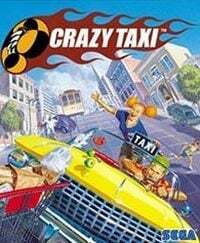 Crazy Taxi is an arcade racing game for everyone and at the same time one of the best conversions from the console. It combines the best features of urban car racing with a huge dose of humour. The player plays the role of a taxi driver, for whom only two things count - the reaction of customers and the tips received from them. You don't have to worry about traffic regulations, you can freely break them and break your neck by breaking almost all the elements of the environment, such as stalls, letterboxes, rubbish bins or tables from café gardens, which are passed on the road. You can drive on the lawns, along the streets against the current and even under the water. It is important to observe the reaction of the transported passengers - if they do not complain and are delivered on time, the tip will be considerable. You can choose from four different drivers, each driving a different car and preferring a different driving style, as well as huge maps of cities to drive, with networks of winding roads, avenues and streets. A simple interface makes it possible for almost everyone to play in Crazy Taxi, especially since, despite a slightly "crazy" approach to the subject of urban traffic, the game is devoid of violence - fortunately, no one can be torn apart. A large dose of humour, enormous dynamics and speed in a great audio-visual setting make the game receive very positive reviews all over the world.